Once you have that first Caipirinha, the national drink of Brazil, the mind may begin to wander to thoughts of South America. More specifically, how do I get there, and how much will it cost me? Better yet, how can I do this on a budget without leaving home? 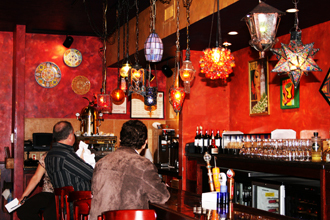 For those wanting to remain within their financial means, a trip to Solea Restaurant & Tapas Bar in Waltham - where the above-mentioned Caipirinha was served - can tastefully quench one's thirst for international drinking and dining adventure. 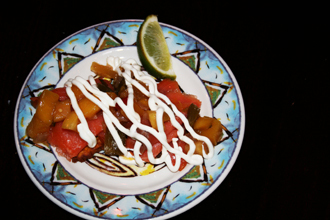 Operated under the caring eyes of owner Fernando L. Leon, Solea serves a wide range of smaller-plate tapas items as well as full-plated traditional entrees prepared with recipes rooted in Spain, Portugal, Chile, and Argentina, home of Leon's grandmother. The drink and wine list is equally as eclectic and international, with a host of wines from the aforementioned countries, as well as sangria, margaritas, mojitos, and more. Our attentive waiter immediately took our drink order and told us that the traditional paella dish ($24) is cooked to order, so a 25-30 minute wait for this entree is customary on a busy Saturday night. Should we go the tapas route, as we planned, he said three to four dishes per person is a good rule of thumb to follow, so follow we did. As we devoured the first of many tapas dishes on our table - Patatas Bravas, small, tangy, flavor-filled spicy potatoes ($5) and Pechuga al Ancho, a perfectly grilled chicken breast brought alive with a sauce comprised of Ancho chiles, tomatoes, garlic and red wine ($7) - I scribbled furious notes in my oversized notebook, drawing the attention of the diners at the next table. When they asked why, my husband joked that I was planning to open a restaurant next door (much to their horror), before I informed them that I was writing a review. At that point, the plates just kept coming, and while most of what we ordered came from the "Tapas Calientas" side of the menu (all hot and cold plates range from $5 to $8.50) we ventured once to the "Frias" side to try the Palta Reina, an avocado stuffed with crab, mango and cilantro ($8.50). Tasty for sure, but we agreed it was in need of just a touch more salt and pepper for perfection. 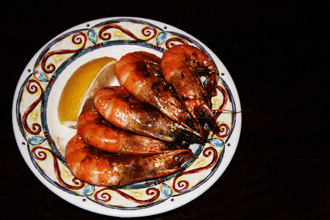 When the Gambas al Ajillo arrived, the sizzling shrimp dish filled our side of the restaurant with the essence of garlic in a very good way. Even my non-shrimp eating husband enjoyed this selection, as did his shrimp- and garlic-loving wife. Perhaps our favorite dishes of the evening, however, were two of the most unexpected choices, as suggested by our knowledgeable waiter. The first: Costillitas, pork riblets so tender the meat fell off the bone, generously coated with a sweet glaze that included pureed bananas and brown sugar ($7). Surprisingly, it was a perfect pairing of meat and fruit. Under the category of the most addictive delicacy, however, were the Bunuelos de Alcachofas y Espinacas, lightly fried and crispy artichoke and spinach fritters ($5) made from a recipe created by Leon's Argentinean grandmother. Though served on a small plate, the fritters were plentiful in number and sat atop a mildly spicy and complementary aioli. After all this, dessert was hard to contemplate yet even harder to pass up, so a Filloa de Dulce De Leche ($8) was ordered and shared. 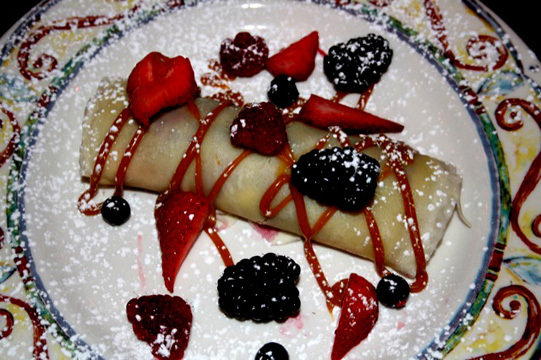 Thankfully, it was a relatively light crepe offering filled with berries, vanilla cream, and the traditional dulce de leche topping, a sweet milk-based sauce that is akin to caramel. While I could only muster one tasty bite, my husband saw fit to finish the entire dessert, enjoying every moment. It is no wonder, then, that even in a down economy, Leon has seen his business grow by 16 percent in the last year, as evidenced by our recent Saturday night visit. Reservations are taken and suggested on weekend nights, and Solea can as easily accommodate a party of two as much as a party of 12 or greater thanks to ample dining and bar space. Sure, one can tango under the stars in Argentina, but one can also have a sultry night in South America by taking a trip to Moody Street in Waltham, and still have money in the bank to boot when the experience is over.